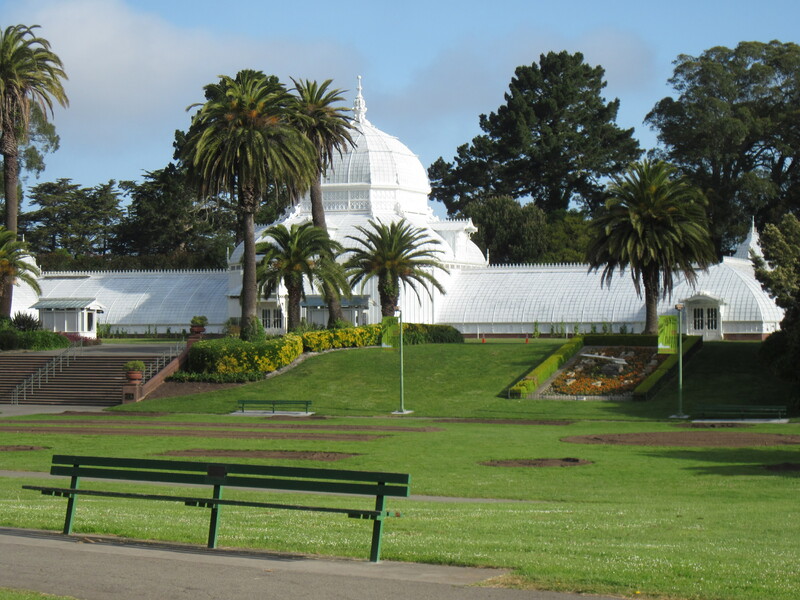 We were hit at the intersection here, in front of the Conservatory of Flowers. Today is the one year anniversary of the Sunday that a driver hit us while we were riding in Golden Gate Park. Last Thursday, Matt took our son to court to get a settlement from the driver’s insurance company for his injuries. It wasn’t much money, roughly equivalent to the cost of the ambulance ride to San Francisco General. We pursued the claim on principle, because higher insurance rates are the only consequence that the driver, Michael O’Rourke, is ever likely to face. Last August, a bike commuter was mowed down by a truck in SOMA. Afterward Sergeant Richard Ernst of the SFPD showed up at her street-side memorial to claim that according to the police report, her death was her own fault. How he could possibly have known that is a mystery, because SFPD also claimed that there was no video of the event. He did this after parking his car in the bike lane and demanding that the people at the memorial, including her family members, admit that her death was her own fault. If they didn’t, well, the cyclists who’d been forced by his parking in the bike lane into the kind of traffic that had just killed someone were just going to have to suffer. His claim, however, turned out to be wrong. The San Francisco Bicycle Coalition canvassed local businesses, only to find that not only had SFPD not bothered to ask for video, but that a local business with a street camera had a video of the truck mowing her down. Then, belatedly and as far as I know without apology, SFPD decided that the truck driver was in fact at fault. Activism like this is why we have doubled our membership contribution to SFBC every year. I wish we could afford to give them millions. I digress. As someone who was run over from behind by a driver in front of a stop sign, this news doesn’t particularly surprise me. Drivers run stop signs and threaten pedestrians and cyclists all the time. They don’t even feel guilty about it. The driver who hit us said, as every driver in his situation seems to, that he “never even saw us.” Even though a statement like that offers evidence that he should immediately have his license suspended—if you can’t see what’s on the road in front of you, then you’re not competent to drive—he viewed this as a completely reasonable justification for hitting people. And he viewed it that way because the police in San Francisco, and many other places as well, are looking to make excuses for drivers when they hurt people. Before I was hit, I was not so cynical. I was raised to believe that the police were there to help people and protect the innocent. The collision changed me. When my son and I had our injuries assessed, the paramedics took off our helmets (and cut off the rest of my clothes as well). For the next half hour that we were in the ambulance as the police took the report, I was asked repeatedly whether we had been wearing helmets. “Were you sure you were wearing helmets? You’re not wearing helmets now. If you were really wearing helmets, where are they? Were you really wearing a helmet?” Then they asked my son whether we were really wearing helmets. My husband showed them our helmets. “Were they wearing those helmets when they were hit?” The paramedics said we were wearing helmets, that they had taken off our helmets. “Did you see the helmets on them?” They asked the (many, many) witnesses, “Were they wearing helmets?” They said yes. “Are you sure?” As an aside, we did not have head injuries. Our heads never touched the ground. If only I had had a leg helmet! In the meantime, they told Michael O’Rourke to go ahead and drive home. He was never charged. It is pretty hard to excuse a driver for ramming into someone from behind. But even though the police finally decided that he was technically at fault for hitting us from behind in front of a stop sign while driving 15 miles per hour, they had to get their digs in. The police report says that I “moved left too soon” when I got out of the protected bike lane to make my left turn. However there is only one place to get over before making that left turn, because the protected bike lane is protected by parked cars. As I lack the ability to transmute my bicycle through two tons of metal, I moved left before I reached the row of parked cars directly in front of the stop sign. Not that it matters, as there is no such thing as taking the lane “too soon” under the California Vehicle Code. Nor should anyone be moving at 15 miles per hour a few feet from a stop sign, even if there weren’t two people on a bicycle in front or a half-dozen people in the crosswalk. Nonetheless, the police report says that I moved left “too soon.” That’s pretty much saying that they thought it was our fault we were hit. At the beginning of this year, the San Francisco Board of Supervisors voted to pursue Vision Zero for San Francisco, a program to eliminate traffic deaths pioneered in Sweden in 1997. Versions of Vision Zero seek to limit speeds, redesign streets and change legal penalties so that driving causes less carnage. Although it’s been successful in other countries, I am somewhat pessimistic about this effort in San Francisco, given how little the SFMTA spends on infrastructure for safe streets, and how limited its ambitions are for the future. However San Francisco’s police culture would cripple safe streets no matter how much the SFMTA agreed to spend. As long as the people sworn to uphold the law choose to blame victims and excuse perpetrators instead of protecting the innocent, change is virtually impossible. You can’t expect people to stop at stop signs, that’s asking too much. A cyclist yesterday told me someone put lights around a stop sign somewhere in Utah. Just because. This story makes me cynical too. I’m so sorry you and your family were subjected to this. Why do you think they were so obsessed with the helmets? Did anyone challenge them on it? If so, what was their response? I was hit once biking home from work. The police definitely mishandled my case and the local police chief said he didn’t have any statistics, but bikers are usually at fault… enough said. It never ceases to amaze me that a driver can say that she/he did not see something in her/his path and get away with it. Aren’t we all responsible for making sure we have a clear path to proceed? I have lights off my commuter and am putting lights on my road bike, just to make me more visible during the day. I didn’t have lights on my road bike this weekend and was looking back and was leery on the busy sections of toads and at stop signs. Helmets are great, especially if you have ever dented one in use. But are they requires in CA? And did it really take the police 20 questions to determine that you and you son were wearing your helmets? Helmets are not required for adults in California. I am generally a very calm person (or so I think) and somehow reading this makes me feel very angry. That said, I could have been that guilty driver. I almost hit a cyclist once while driving. I had stopped at a junction waiting to turn right. The light was red against me. After checking for traffic, I started to turn right and that was when I got an angry “f you” scream from a cyclist. I was petrified and gestured my apologies (while in shock). Granted it was early evening and he didn’t have lights on, there was still enough light for me to have noticed him. I think it said something about what I was expecting (not expecting bicycles there). I was lucky I didn’t hit him that day and that really made me look and look again. Thanks for the honesty, Jackie Kim. I think this is one reason why drivers get sympathy from juries, police, non-cyclers. HotC mentioned the 3rd-degree on helmets, and I think that’s part of the narrative– “it must have been the biker’s fault”. Sadly, I wear a helmet mainly to protect myself from the narrative than to protect my skull. I also video record my bike commute… just in case of collision. I look forward to the day that vulnerable users are given the benefit of the doubt, and autos are held to the standard that they prove their innocence in a collision. I would have sued the everliving pants off that driver. We talked to a lawyer, who found out that he had no money, which is also why he had such crappy insurance. I’m so sorry you had to go through this, but I am glad you are still here and being an amazing inspiration to us all! Your experience is truly horrific. The combination of your job as public health researcher and your gripping personal story might be what it takes to make some changes. Meet with your city and state reps to put forward a regulation that any motorist who says “I did not see it” to a police officer regarding any type of collision has his/ her license immediately revoked until he or she re-takes and passes the drivers license exam again. Driving on public roads is a privilege, not a right. Being able to see what is around you is a Basic Requirement. Since there is no credible argument FOR blind drivers on public roads, it should be a winning piece of legislation for your reps.
Also, I hope to read in an update that the San Francisco Bicycle Coalition has gotten Sergeant Richard Ernst on a two year stint on pedestrian and bicycle duty only (banned from operating SFPD vehicles for 2 years). I live in Ontario Canada. We have laws in the highway traffic act that cyclists are never deemed at fault automatically in car- vehicle accident. In fact the onus rests with the driver to prove he / she wasn’t at fault. Toronto isn’t a great city for cycling as we have too few bike lanes but there is a movement to make it better. The states needs to implement larger respect for cyclists. BTW I ride with my 3 kids and wouldn’t change it for the world.